Feeling stressed about choosing a major or career? Are you questioning your career path? Looking for more support in your career development? Join our FREE career development counseling support group! All students welcome! 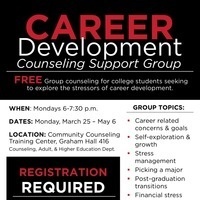 In this group, you will talk and connect with other college students who feel stressed and uncertain about their career path. Also, learn more about career development and stress management. REGISTRATION IS REQUIRED! To register, email CAHC_CCTC@niu.edu for further instructions.